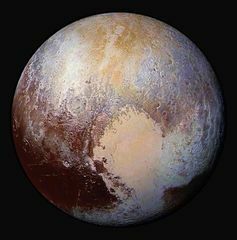 Perhaps one of the biggest surprises that was obvious from the very first images was that Pluto has a surface that is incredibly diverse. Other areas, such as the informally named Sputnik Planum – the heart-shaped, Texas-sized nitrogen ice glacier – show no evidence of asteroid impacts at all, suggesting continual surface activity, such as convection of ices from underground. This surface can’t be more than 10 million years old – a blink of the eye on a geological time scale! Pluto is geologically active! I doubt there’s a single person on Earth who would have expected to see that!